Who’s Coming Up on Monday, January 30? Onio Punzal welcomed everyone with the haunting call of the “pu” and acknowledged the highly vocal and energetic Kauai residents; Carol Yotsuda welcomed all the new and returning visitors, gave huge mahalo to the primary sponsors, HTA and KBR, acknowledged Auntie Maria for artist interviews on her Friday morning show on KKCR radio, and gave an overview of the extraordinary line up for the 34th season of EKK. Ooooh’s and Ahhhhh’s could be heard from the audience as the artists were announced. Leading off the program, Sally Jo Keahi Manea introduced her grandson Mika Kane, born and raised in Maui, who studied at Kamehameha School’s Maui campus and is now a junior studying music at UH Manoa. 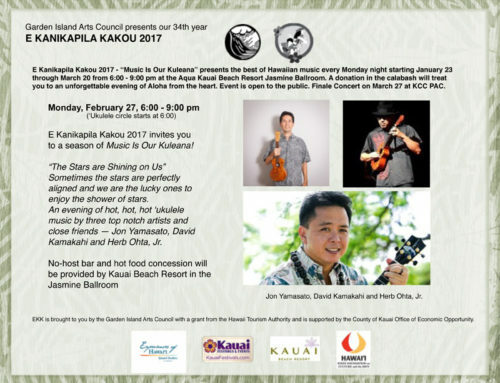 Son of Dain Kane, a 1980 graduate of Kauai High School, Mika started playing the ukulele at age 13 and is now mentored by Dr. Byron Yasui, a well-known Hawaii jazz musician. As a child, he spent a lot of time at Camp Naue in Hanalei with grandpa Herman Kane. He likes to play old songs so “Old Soul” is a fitting title for his first CD which came out 4 days ago and is premiering tonight at EKK. Some of his ‘ukulele numbers included Errol Garner’s Misty; a Beatles favorite Yesterday; the hapa-haole Sophisticated Hula in jazz style; This Nearly Was Mine by Rodgers and Hammerstein from movie South Pacific; Harold Arlen’s Somewhere Over the Rainbow from the movie Wizard of Oz; If I Love You, a show tune from Carousel and Queen’s Bohemian Rhapsody written by the singer Fredie Mercury. He picked up a lot of fans from his first gig at EKK. 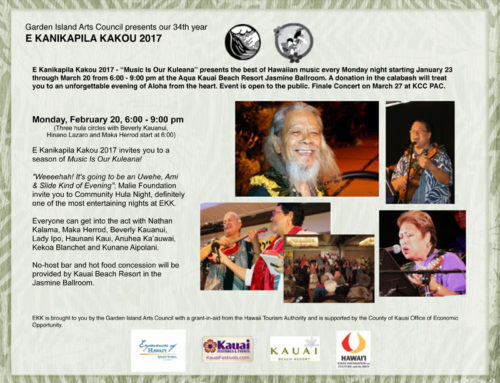 Drummer Koko Kaneali’i, who has been playing drums for over fifty years since his early introduction as a kid in Kalihi watching the Marines, his first drum teachers, gave a 25-minute time travel through 6,000 years of drum history. He talked about the first clay pot drums in Africa through drums with skin stretched over a log; noisy metal drums by the Chinese, French snares, Swiss innovations and innumerable contributions by drummers in North America and Canada. It was fertile field for innovation as Indians, Cubans, the Latin countries added their claves, congas, Cajun music and Latin rhythms which eventually open the path for rock and roll. John Phillip Souza, who played every instrument in his 110-instrument band solidified the marches with their distinctive drum beats, but that was only the start as every group of people used drums for signals, celebrations, and just plain entertainment. The introduction of the first base drums with pedals opened up the playing field more and more were added to the drum sets. In Hawai’i, the modern drum sets and the Pahu drums share the same stage; to-ete was used to call folks to church by the missionaries. This brief intro to drumming brought on stage the featured drum group. Emcee Rhoda Libre introduced Tepairu Manea , leader of the Orama Tahitian Drum group. He introduced his drummers who have been playing with him for six months. Tahitians speak with their hips in their danging. Dancers came up to demonstrate 15 basic drum beats with their gyrating and swinging hips. As is often done when Tahitian drumming is shared, brave audience members are invited to come up and try out their hips and feet action to the rapid rhythms of the drum; one brave dancer ended up doing a major solo number … bravo! Before the intermission, Mika Kane played a short tune on the Kamoa ukulele; after the intermission this same ukulele was won by an elated gentleman from the continent. Also given away were six CD’s to Mary Cranston, Penny Prior, Lloyd and Lee Anderson, Susan Adams from Kilauea, Ken and Lorraine from Calgary and Teresa and Francois Hevin from Arkansas. 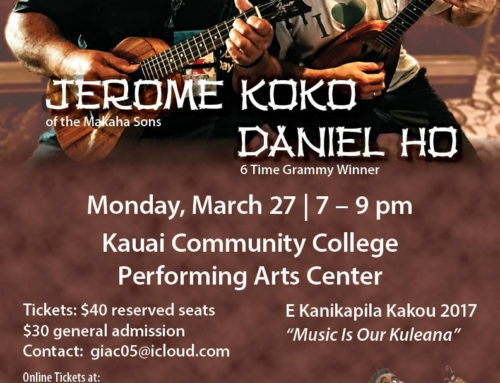 Koko Kanealii and his nephews, Chad Keola Pa, a solo singer, and Paul Kaiminaauao, who has his own band, brought up the second half of the evening with a lively selection of backyard jam favorites such as Ulili-e, about the sandpiper or golden plover, Margarita with Chad as lead soloist, and a reggae-beat song from the westside of the island. 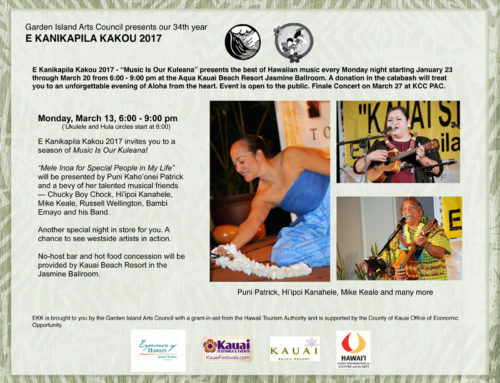 The dancers of Roselle Bailey’s halau had a chance to teach a hula and the singing of the songs Mo’olele and Po’ipu to the audience during the ‘ukulele hour at the beginning of the evening. 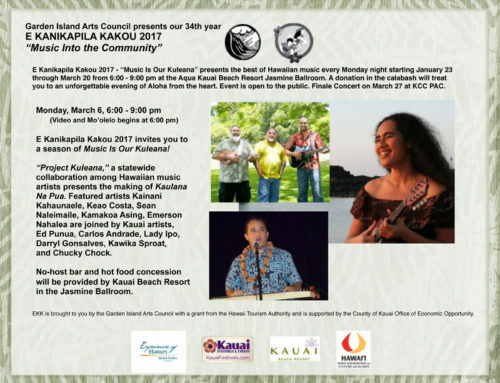 However, the evening zipped by much too fast so, unfortunately, the audience was not able to enjoy the performance of He Mele No Kane, a traditional oli choreographed by Roselle Keli’ihonipua Bailey and the sharing of the song Mo’olele prepared by the dancers of Roselle Bailey’s halau. All joined hands for the closing song HAWAII Aloha which always gives everyone a positive lift as they bid each other a hui hou until the next Monday.